Whether you’re earning a degree on a full- or part-time schedule, seeking personal enrichment, or exploring professional development, our online art courses give you the flexibility to pursue your creative goals wherever you are. Online courses meet through Learn@UW, a virtual classroom for learning. To access course materials all that you need is a connected device with a modern web browser. Live instructors provide a syllabus listing important assignments, deadlines, and virtual office hours. You’re free to manage your own time, online classes follow the same semester calendar as on campus classes. Instead of attending class at specific times during the week, you’ll access course materials and lectures, participate in discussions and research, take quizzes, and submit work according to your own schedule, as long as you meet the assignment due dates and other deadlines. 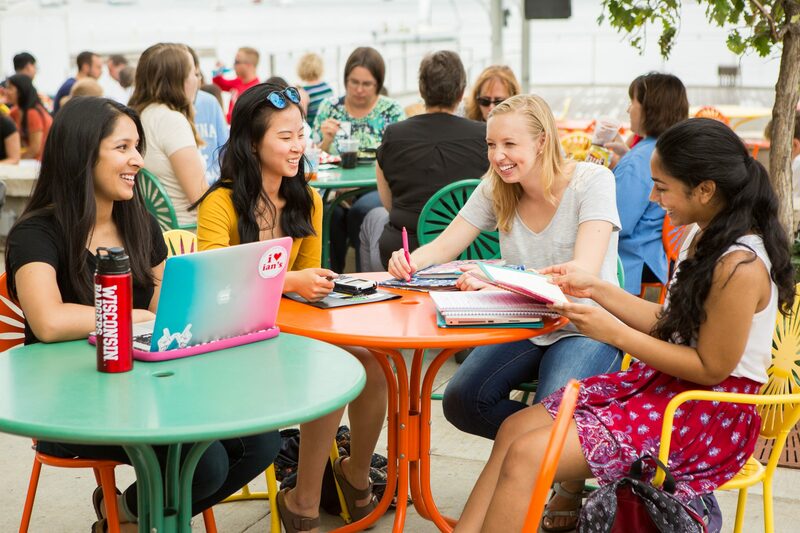 Online courses cover the same objectives and competencies as courses offered face-to-face on campus, giving you the full outstanding UW–Madison experience. Enrolling in summer term saves you money to complete your degree in four years with two Summer Terms, rather than taking a fifth year, and you’ll gain more time for internships or other opportunities down the line. Many courses open to beginners, non-art majors, & special students! This course seeks answers to the fundamental question “What is art?” Through our lectures, readings, discussions, and creative projects, we seek answers from multiple perspectives—historical, theoretical, critical, conceptual, formal, and experiential. Throughout the course, students develop visual literacy, sophisticated observational skills and a formal language to assist in the interpretation of objects and experiences in the context of art. Through both theory and practice students develop an understanding of the ways artists arrive at the ideas that inform their creative processes. This course includes a survey of developments in art media and looks broadly at art movements, trends and styles throughout history and in varied world cultures. We maintain a tighter focus on Modern and Contemporary art from approximately 1800-present. The intellectual, cultural and physical components of the visual arts are presented as an essential and interrelated whole. Why Art? Concept, necessity, awareness, perception, aesthetics, creativity, persona, perspectives. Representational, and Non-Representational forms of art. Form and content; style and iconography. Elements of visual communication. Aesthetic evaluation. Themes and Purposes of art: major subjects; personal and cultural functions. Visual Elements of Art: line; shape and mass; light, value and color; texture; space; time and motion. Principles of Design: unity, variety, balance, emphasis, proportion, scale, rhythm and repetition. Visual mediums and methods: Drawing, painting, printmaking, photography, cinematography, television, electronic imaging, sculpture, clay, glass, metal, wood, fiber, architecture, urban and regional design. Art of the past: overview of ancient through Baroque & Neoclassical art in the western world; art beyond the western world, geographically, thematically, and formally. Art of our time: 19th, 20th and 21st century cultural upheavals that yielded Modernism and Post Modernism. Issues of expression, structure, cultural diversity and internationalism. Art for today and tomorrow. Art reveals the past and the present. Art as a tool for shaping the future. Foundations of Contemporary Art surveys the movements and theories of the twentieth century that inform contemporary art production. Special emphasis will be placed on the shift from modernist models of art making to postmodernism’s critical deconstruction to our current post-historical phase. describe basic qualities and conditions of Modern art as well as several exceptions. describe the technological, political, social, and economic conditions that created the backdrop for the emergence of various Modern art movements. describe at least 8 Modern art movements, key artists in the movement, important works and media, and the content of the manifesto when applicable. identify the work of a variety of artists and critics and describe their contributions. identify key figures that shaped the culture of the 20th Century including Freud, Walter Benjamin, and Karl Marx and describe their significance. be able to describe both impediments to the participation of women and people of color as well as specific strategies various individuals and groups used to access and participate in the art world. describe examples of non-western art of the same period. discuss the concept of “male gaze” and how this evolved during the 20th century. engage in discussions and demonstrate development in both your ideas and your ability to articulate those ideas. create several original works in response to the course content. demonstrate an understanding of the institutions and practices related to Modern art. relate specific artists’ work and practice to issues of identity, perspective, spirituality, etc. demonstrate an ability to be critical consumers of visual culture. Introduction to tools, techniques and concepts of digital photography, with an emphasis on the workflow beginning with composition and image capture, to digital manipulation and enhancement, to the end goal of print or online publication. Students will develop a robust fundamental skill set in digital photography through lectures, readings, discussions, practical instruction, instructor review and group critiques. Students who’ve previously completed Art 176 are encouraged to enroll in Art 448 Continued Digital Photo for Non-Majors. Current Directions in Art (Art 208) examines current artists’ motivations, intentions, processes and their relationship to general developments in contemporary art. Writing for and About the Arts (Art 236 Bascom Course) satisfies the Communication Part B requirement and is a low-enrollment course that develops skills in critical reading, logical thinking, use of evidence, and use of library resources. This course will teach you to communicate effectively about an incredibly difficult subject: art. We will explore a range of different art forms and genres, including photography, sculpture, music, and film. Emphasis is on writing in the conventions of the visual arts. When was the last time you watched/read/looked at something that made you laugh until you cried? Or made you cry because you were so profoundly moved? Can you explain why? What specifically about that work of art affected you so intensely? Maybe you read a poem that caused you to think about something in a completely new way or looked at a photograph that made you reconsider a previously held belief. What was it about that poem or that photograph that made you change? Art affects us in real, visceral ways, but it is incredibly challenging to explain how and why. The task for this eight-week summer session is to practice writing about art in a persuasive, well-organized, and rhetorically effective way. Learn to notice the ways that art is already a significant part of the rhythm of daily life and culture. Think about ways that we create art (even if you don’t think of yourself as an artist) and how making art affects the way we write about art. Think critically about how a piece of art works and consider how social, historical, and political contexts affect the meaning of a work of art. In this course, we will use digital tools to bring your stories to life. We will create audio, visual or interactive media projects to tell stories about the people, places and issues you care about. We will also be exploring the practices of contemporary digital artists. This studio intensely engages a wide range of image-making techniques. It is ideal as a broad primer for anyone interested in a serious pursuit of photography, digital media, printmaking, graphic design or self-promotion. Each week the class will cover a new process and wrap up with a lively critique.